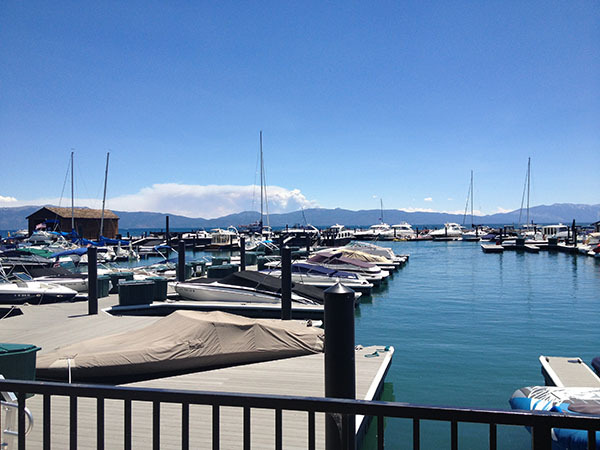 We’re back home from Lake Tahoe after getting up early this morning, having a nice breakfast at the resort and driving home long before the traffic rush on 80. I’m glad to be home after such a fun and active vacation even though facing a mountain of dirty laundry emptied from the suitcases. And I need to step out at some point to restock the kitchen. Instead I’ll recap the last of our fun adventure. For the 4th of July, we stepped out to the River Ranch Lodge for dinner and this was a nice throwback for me since I have fun memories of staying there with family as a kid. 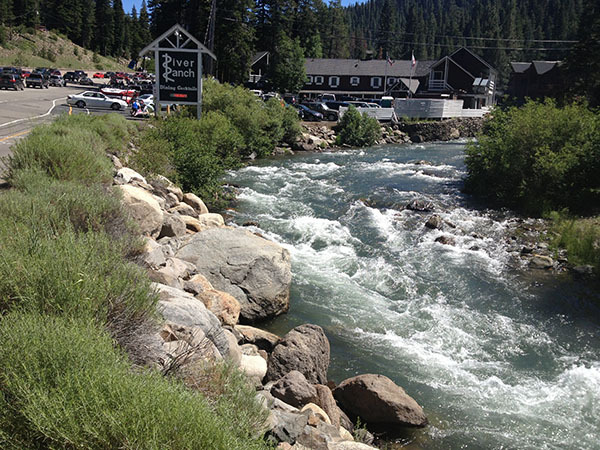 It’s a funky and quaint place on the Truckee River with a great patio for enjoying the rapids. And since everyone was heading to the lake for the fireworks show, it was not crowded and we got the best table on the patio. 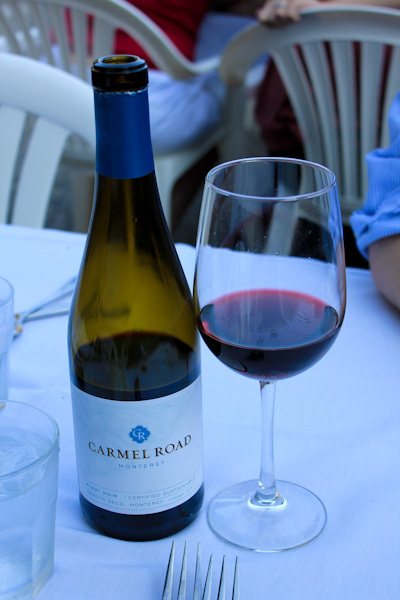 We started with a bottle of Carmel Road Pinot Noir, a pleasant, vegan-friendly pinot. 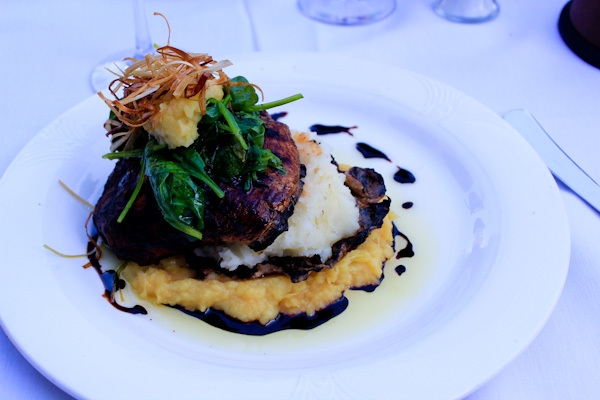 And I had the fabulous Portobella Mushroom Napoleon, a stack of grilled portobella mushrooms with mashed white and sweet potatoes layered with tomato, spinach, and crisp onions drizzled with a sweet balsamic sauce. It was wonderful and I’m not usually a fan of grilled portobella because it can be too much mushroom for me. But these had a nice balsamic flavor marinated in and were sliced thinly to be grilled to a crispier texture – very good. Friday was a gorgeous day in Olympic Valley, this was the perfect view from our room. 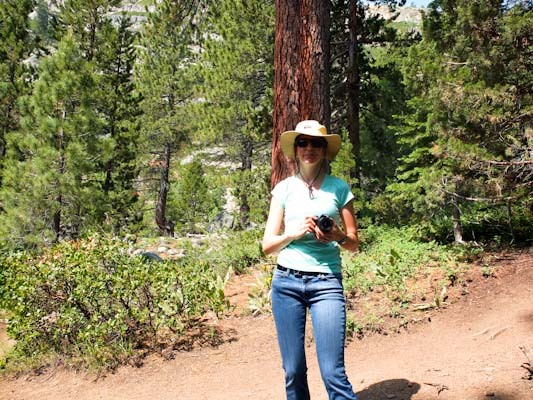 We grabbed the bikes and rode the Truckee bike trail to from Olympic Valley to Tahoe City, about 5 miles each way and plenty of trails along the lake and around Tahoe City once we arrived. 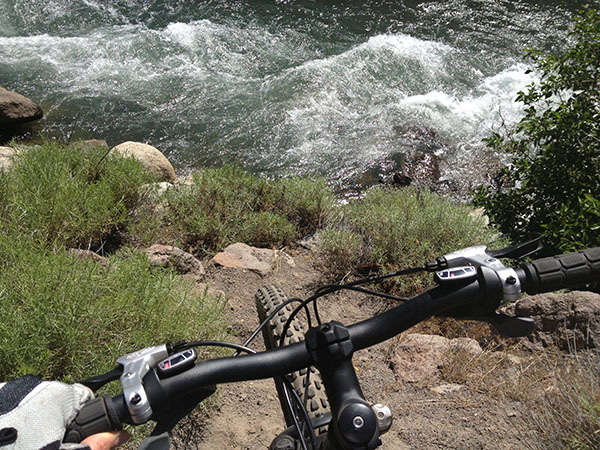 The views along the Truckee river were amazing. And we got to watch all the rafters on the river and whew, there were a lot of them for the busy 4th of July weekend! 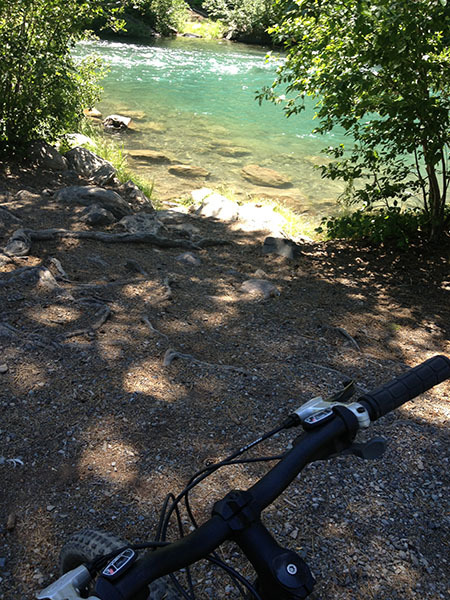 When we made it to the lake, we explored the trails around it for many miles and took in the views. 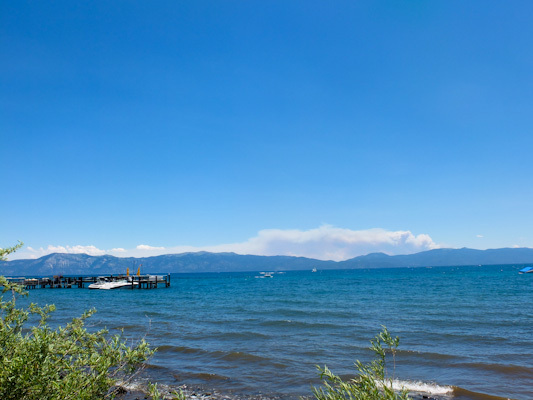 The water color was perfect and we got to watch a wild fire on the Nevada side, luckily the smoke did not affect us. 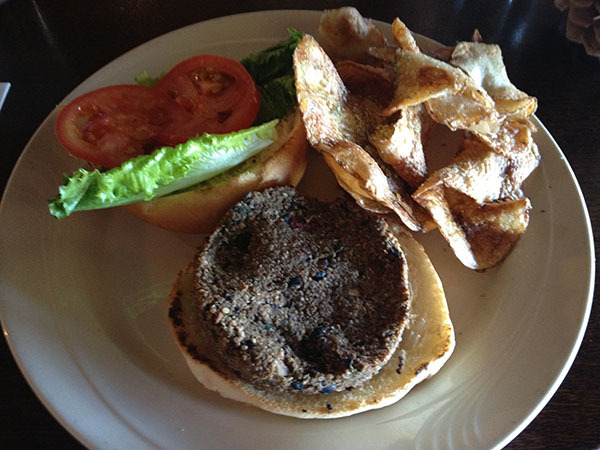 We stopped for lunch at the Dockside 700 Lakefront Grill where I got this unique quinoa burger with fun, house made monster seasoned potato chips. 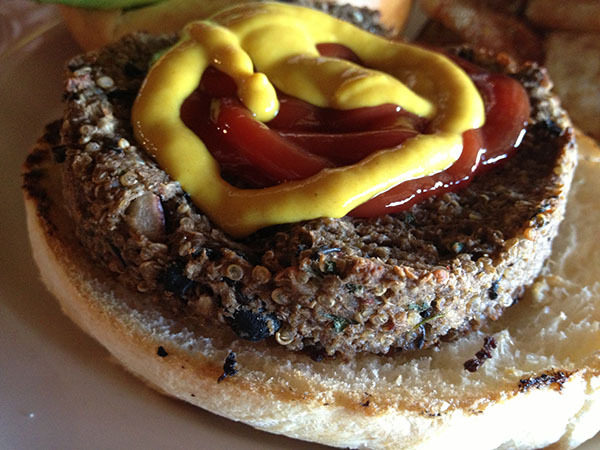 The burger was an interesting blend of quinoa cooked in chocolate stout and black beans. I skipped the mayo it came with and added ketchup and mustard instead which added needed moisture to the burger. The flavor of the burger was good, a little spicy, tangy, and savory. I would get it again easily. And it was great fuel for the ride back to the resort. All in all, it was a great vacation with a lot of activity, enjoying nature, and many great eats. 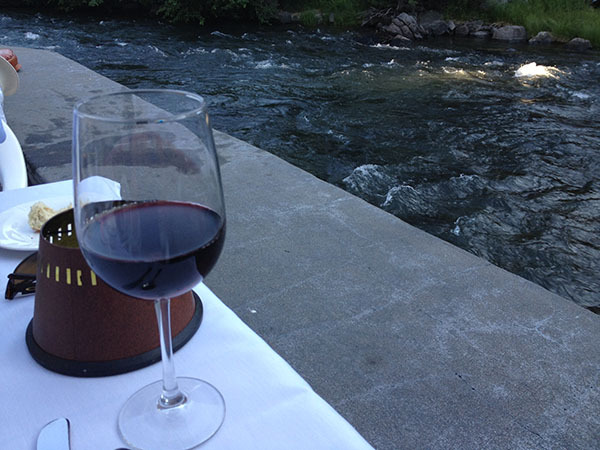 We’re already looking forward to our next Tahoe trip. 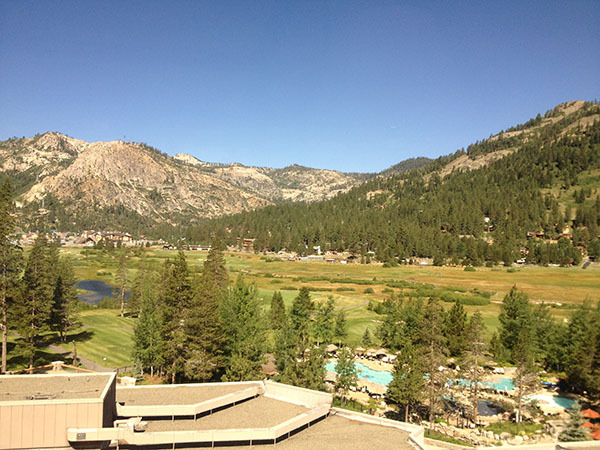 We stayed at the Resort at Squaw Creek and I’d highly recommend it for the easy access to many outdoor activities – golf, skiing, hiking and biking trails, rafting, etc. But it’s also a nice luxury resort with nice restaurants, spa, gym, and great amenities – best of both worlds. Welcome Back! LOVED seeing the sites you posted here and on IG. Looks like a great time! FUN! Did you take the furkids with you or did they stay elsewhere? All of the food looks amazing, too! WOW! Awwww so glad to here they had some fun, too!